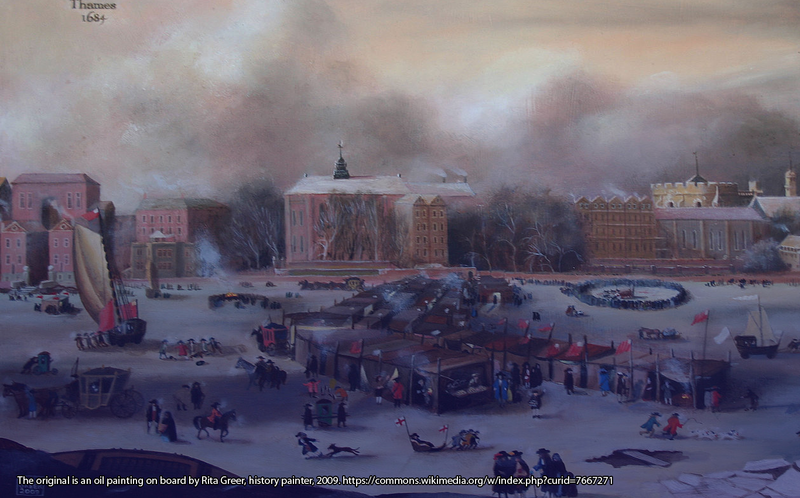 The legendary frost fairs on the River Thames are depicted in a number of works of art that show just how cold, icy and severe the weather became during winter, in comparison to the weather experienced in London in modern times. The idea of a frost fair on the icy surface of the River Thames in London may seem a flight of fantasy today, especially when one appears, or is mentioned several times in one of the UK’s favourite sci-fi television series, Dr Who. In one of the scenes set during the 1814 Thames frost fair, the doctor encounters an elephant walking across the frozen surface of the Thames. In another episode the doctor takes River Song to the same event to celebrate her birthday. The Thames frost fairs are also featured in two tracks on Snow on Snow, by The Albion Christmas Band, a beautiful collection of Christmas and winter songs on CD. Today, the idea of such a novel event with crowds of people, stalls, entertainments and all the fun of the fair on the frozen River Thames may seem surreal, but it did happen several times in the past. Here we look at some of these times and see how it affected Londoners; what they did and how they coped in those frigid times. The River Thames has long been an important trade and transport route, and many kinds of businesses, large and small, flourished around it. The river swarmed with large and small boats, manned by watermen who ferried people and goods up, down and across the river. Many people lived, worked and died around the river and a rich culture of folklore and legend evolved, some of which remains today. With the great river of such importance to Londoners, how would they cope when it suddenly froze solid, allowing no ships or boats to travel up, down or across it? Although it is written in legends and folklore, it is also historic fact that the River Thames has frozen over a number of times, hard enough for the usual daily commerce to be brought to a halt. These extreme cold events happened during a period known as the ‘Little Ice Age’ that some people believe lasted from 1300 to 1870. (Expert opinion varies on this subject, and is not dealt with here.) During the winter of 1536, Henry VIII was said to have enjoyed a sleigh ride to Greenwich from the centre of London on the Thames ice and in 1564, Elizabeth I strolled upon the ice and practiced archery on the frozen river. The worst of the big freezes occurred between 1550 and 1750. 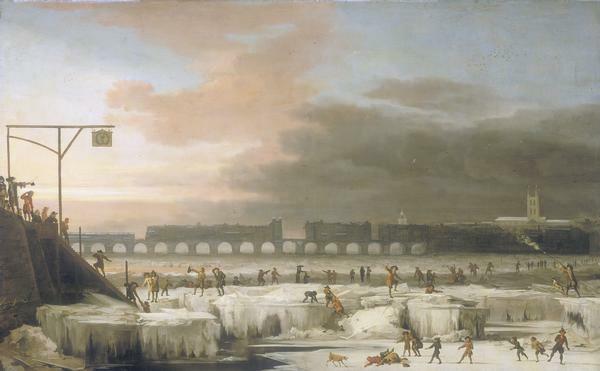 During the winters of 1683 – 1684 and 1715 – 1716, the Thames was frozen for three months, but most events were usually much briefer. When it did freeze over it not only brought the river to an abrupt halt, it brought the every day business of the city and its people to a standstill too. However, Londoners, being innovative and enterprising, adapted. In its frozen state, the river effectively became a highway that wagons and coaches could traverse while the boats were stuck in the ice. Furthermore, it became an extension to the land, offering new opportunities not just to make money but also to have fun. Londoners like to have fun. In 1608, the first recorded London frost fair took place on the icy surface of the River Thames. During December, 1607, the ice was thick enough to walk upon from Southwark to the City, and by January 1608 the ice was thick and strong enough for a whole host of activities on its surface. A small town of stalls, booths and tents sprang up selling many different kinds of food and drink. Tradesmen such as shoemakers and barbers set up stalls selling their wares and services and even lit fires on the ice to keep warm and use for cooking. Among them, skittles and bowling and many other sports and activities took place to the enjoyment of the people, including “folk“ football. This was not like the modern game of football where two teams compete and rules are followed. This competition was between two mobs with virtually no rules and they often became free-for-all, no holds barred, riotous events. “The frost continues more and more severe, the Thames before London was still planted with booths in formal streets, all sorts of trades and shops furnished, and full of commodities, even to a printing press, where the people and ladies took a fancy to have their names printed, and the day and year set down when printed on the Thames: this humor took so universally, that it was estimated that the printer gained £5 a day, for printing a line only, at sixpence a name, besides what he got by ballads, etc. Evelyn tells how even printers got in on the act. One named Croom, came up with the idea of cashing in on the novelty of the event by selling souvenir cards for sixpence each. They carried the customer’s name, the date, and proclaimed that it was printed on the frozen Thames. These were extremely popular and Croom was said to be making five pounds a day. Even King Charles II was said to have brought one. It was this impromptu frost fair that began the rise of Chipperfield’s Circus, which also provided entertainment. It seems for many Londoners the sheer novelty of the frozen Thames inspired the enterprising and opportunistic citizens to make the best of the bad weather while making money and having some fun at the same time. Despite the cold, folk, young and old flocked on to the frozen river in their thousands to enjoy the wide variety of activities and events that suddenly sprang up. From a Print of the Frost Fair, 1684 we learn that hackney carriages and horse and carts used the frozen river as if it was a road. A street of booths and stalls sprang up selling beers, brandy, and every kind of alcoholic beverage, and there was music and dancing and many other entertainments. There were booths that sold hot coffee and food. Rabit, Capon, Hen, Turkey, and a wooden Jack. Events such as blood-sports and folk football took place and all sorts of merchants and traders brought their wares and services to sell on the ice. As well as being a place of novelty and entertainment it became a market where all sorts of goods and merchandise were sold and prices became higher on the ice than they were off it. However, not everyone approved of what was happening, nor of the behaviour that was being displayed by many people on the ice. Not just the drunkenness and debauchery but the philosophy of how the money was being made and how it was bringing out the worst in people caused concern in some quarters. Londoners were hit by another hard winter in 1715-16 when a number of heavy snow falls clogged up the city, and it was so cold the Thames froze over for almost three months. Once again entrepreneurs took to the ice erecting booths, tents and pavilions selling all kinds of goods and services. People flocked on to the frozen river to have fun and on 19th January two oxen were roasted over fires set upon the ice. The activities on the ice drew people away from the theatres and even the Prince of Wales visited the frost fair. Horse-drawn wagons, coaches, barrows, carts and vehicles of all sorts were taken onto the ice, transporting goods and people upon the frozen surface, and a preacher aroused and warmed his congregation with a passionate sermon. The Thames, being a tidal river, was also subject to the tides as well as the frost and cold. An abnormal high tide raised the ice by fourteen feet, flooding cellars in buildings alongside the river but not putting the revellers out of their stride. On 15th February the ice began to thaw and split, breaking up the party. The winter of 1739-40 was another severe event that was remembered for the intense frost and cold and produced another Thames frost fair. It began on Christmas Day and lasted into the New Year, before finally beginning to slowly thaw on 17th February, and became known as “The Great Frost“. The weather was said to be more severe than the weather around Hudson’s Bay, Canada. The poor and working class struggled to find food, fuel and water. With the weather so bad there was little or no work for many trades such as the watermen who worked on the Thames, as well as fishermen, carpenters, bricklayers and many other trades. A march was held to bring their plight to the attention of the rich and the rulers of the city who granted some relief to the suffering people. A few days after the arrival of “The Great Frost“ a powerful storm struck the Thames and its estuary causing great damage to boats and vessels. Icebergs and floes caused havoc and eventually froze together, covering the surface of the river and turning it into an alien scene of a snowy field with small uneven hills of snow and ice with icebergs protruding through the icy white surface. 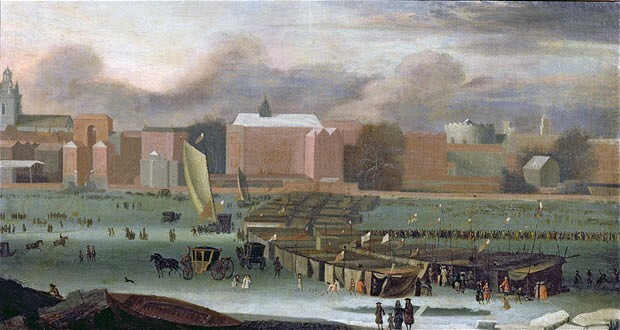 When the weather settled another frost fair sprung up on the ice of the Thames selling all sorts of goods and services. Again the printers were there and there was the usual drinking and eating booths, puppet shows and a great variety of entertainment and sports. A carnival atmosphere prevailed as the people sought to forget the problems and difficulties brought on by the severe weather. The ice lasted for about nine weeks before it thawed and broke up. At the end of December, 1767, a severe frost began and continued to strengthen until 16th January, causing the River Thames to freeze over again. Ships, boats and river vessels became trapped in the ice and many were severely damaged or sunk by the ice flows moving with the tides. During this period many lives were lost and the price of meat and food went up so much the poor could not afford it. The Lord Mayor of London, Thomas Harley, provided subsidies on bringing fish to Billingsgate market, helping to alleviate the suffering. The poor continued to suffer great hardship both in London and out in the countryside where roads were impassable. Coal, fuel and food became scarce and expensive because it could not be moved and the severe weather caused many accidents and deaths. A violent storm also caused chaos and damage in the city amounting to £50,000. A severe frost began on 25th November, 1788, and lasted for seven weeks. On 5th January, the Thames froze over and once again a fair and market with puppets shows, drinking and eating booths and even exhibits of wild animals appeared on the ice. 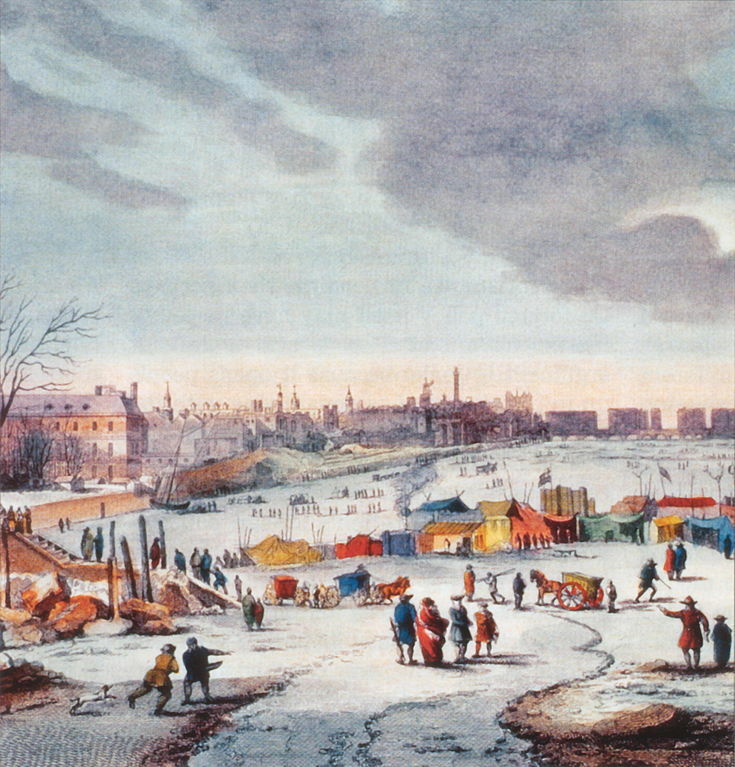 The last frost fair on the frozen River Thames to date began on 1st February, 1814, and lasted four days. As with previous frost fairs an enterprising printer named George Davis set up a stall and typeset, printed and published a 124 page book titled, Frostiana; or a History of the River Thames in a Frozen State, which he sold as a souvenir. Again there were stalls and booths selling all kinds of goods, wares and services. The watermen, being unable to work, used the sails from their boats to make booths and tents to accommodate the selling of food such as roast meat and gingerbread. While tea, coffee and hot chocolate were available, it was the gin, beer and wine that was most popular. These beverages were sold in “fuddling tents” which were temporary makeshift inns. A variety of entertainments were held on the ice including skittles, football, ox roasts and dancing. The watermen charged for entry on to the ice and to watch events such as an ox being roasted. These services were often provided by the same families whose ancestors had provided for previous Frost Fairs. The atmosphere was very raucous and boisterous with a lot of drunkenness and people being fleeced of money. There was no police force in those days, and the watermen kept order, broke up fights and controlled the ice. One of the most novel events was when someone led an elephant across the frozen river, which must have created an extraordinary scene. There were treacherous times ahead when the ice started to melt and break up, often bringing death to people and animals alike, damaging property and flooding. The harsh weather also affected people living in the countryside and other parts of the UK and across Europe. The Old London Bridge (1176-1825), was one of the most iconic images of London and was partly responsible for the Thames freezing over. Its design slowed the water down and trapped ice floes, causing them to clog up the river and freeze together. The river was shallower and wider and flowed slower than today, making it easier to freeze. In 1831, the Old London Bridge was demolished and replaced by one designed to have wider arches that allowed the river to flow through much more easily. Also, the construction of the Thames embankments made it deeper and flow faster, reducing the chances of it freezing over on its way through London with the same intensity of the past. Another factor that might contribute to preventing a big freeze on the scale of the past is the heat given off by the mass of tarmac, concrete and heated buildings. This helps keep London considerably warmer in winter than areas outside the capital but in the summer can make it uncomfortably so. That being said, no one really knows what the future will bring with global warming, which may cause a few surprises. The Thames frost fairs became a part of the rich bank of London history. 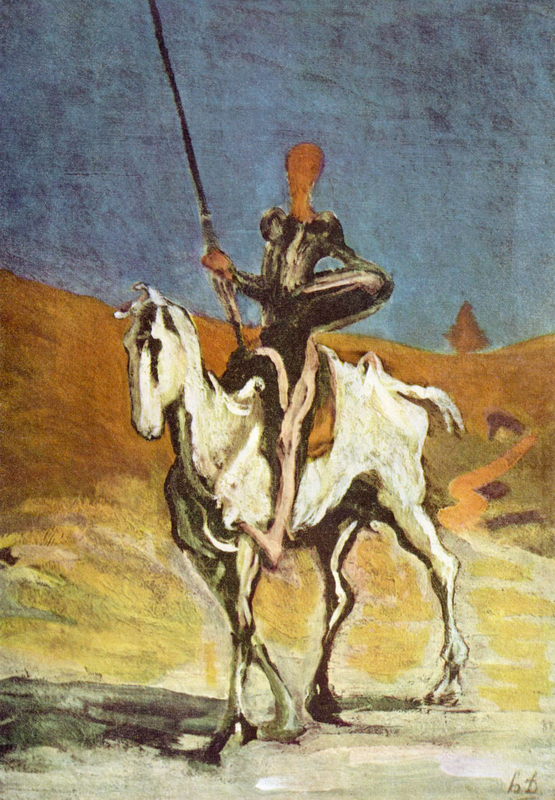 Works of art and literature of the time gave future generations a vivid impression of the sheer novelty and rarity of these special events enjoyed, but also suffered, by Londoners. The frost fairs were a testament of the endurance and entrepreneurial spirit of Londoners and an example of their ability to make the best out of what really must have been very hard times for many people. Cahal Milmo, 2014, ‘When winter really was winter: the last of the London Frost Fairs’, The Independent, Friday 31 January 2014.